A young man suffering from mental problems and initially believed to be waving a sword kept police at bay for nearly six hours outside his Upperline Street home on Thursday afternoon before surrendering. The man’s weapon turned out not to be a sword, but a long wooden object, said Officer Frank Robertson. No other weapons were found on the man or in his home, and no one was harmed in the confrontation, Robertson said, though police did deploy tear gas into the home in an attempt to force the man out. 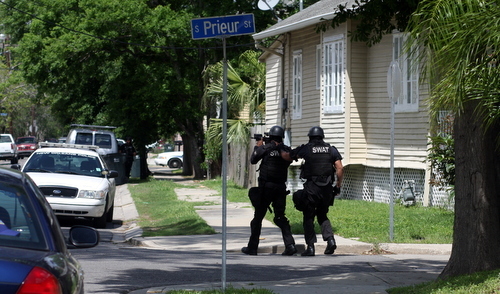 The standoff began around 12:30 p.m Thursday when the 22-year-old man’s mother called police about her son, whom she said was “irate and out of control,” said Officer Garry Flot, another NOPD spokesman. He was described as waving a sword around, but when police arrived, he locked himself inside, Flot said. 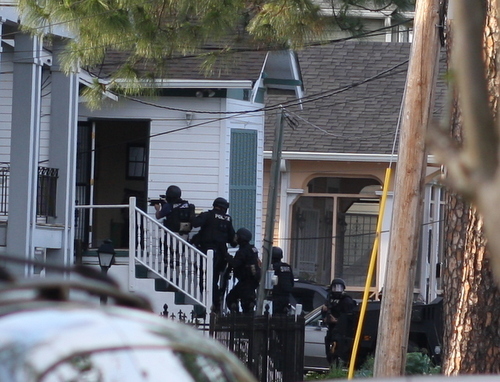 From that point, police began to assemble outside the home in the 3200 block of Upperline. 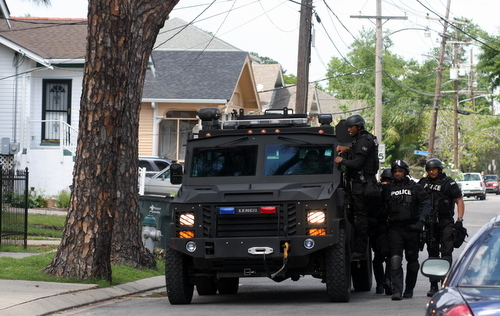 Crisis negotiators on a loudspeaker tried unsuccessfully to coax the man out, and shortly before 6 p.m., SWAT team members fired several rounds of tear gas into the house. A team of officers then entered and made what Robertson termed “peaceful contact” with the man, and he agreed to surrender. He was then led out of the house, shirtless, to a waiting patrol car. The man won’t be charged, Robertson said, but will be given a full mental evaluation. Police have been to the home several other times in recent weeks to handle disturbances he has caused, Robertson said. Many neighbors said they hadn’t met the man, though his father is well known for the garden he has planted in the yard of a vacant house next door. One neighbor said he had encountered the young man for the first time three days ago, when the young man showed up at his house to say that the neighbor’s dog had escaped. He seemed unusually offended that the dog had been on his property, but also acted as if he wanted to stay and socialize, the neighbor said. Several neighborhood residents, however, drew immediate parallels between the standoff and the cuts to mental health services in the region. 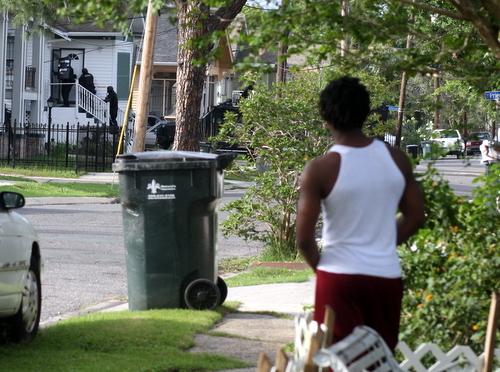 Leon Price, a Bywater resident visiting his mother on Upperline, said that in addition to the cuts in mental services, police are too busy patrolling tourist areas to serve the city’s neighborhoods. every single day I encounter people who need help and can’t get it. This city is no longer about the original residents-It’s for tourists and all of these new people from the east and west coasts showing up here and claiming to be locals. “Making changes” to our city and then leaving. People who were here before Katrina deserve to be the focus of our money and attention. Wow. It’s that “us vs. them” attitude that made New Orleans such a backwards place for the past, oh, forever. Since when did “new people” become such a four letter word? Re: ” ….. that in addition to the cuts in mental services, police are too busy patrolling tourist areas to serve the city’s neighborhoods.” The combination of cuts to mental health services, combined with an ill-trained police force makes me feel much safer when the cops are not in my neighborhood …. we defintely need more social services and the restoration of mental, physical and public health monies ……..
Total agreement here for the above comments. Has anyone else noticed that New Orleans is very close to being a caricature of itself? No offense to the many, many, well-intentioned new residents – but really, please understand that the various cultures of our city are not all about the things so often embraced by the tourism industry and media. Second lines for grocery store openings? ?